Firstly, Derek Prince is just excellent! I have been hearing for some time that I need to familiarize myself with his resources and I am so glad I finally did. I wish he was still around (he passed in 2003), but am amazed at how large and thriving his ministry still is! Rules of Engagement centers on building the character of a warrior, embracing the Holy Spirit, and understanding the basics of the supernatural realm so that we can be successful in spiritual warfare. Each chapter is short, thought provoking, and set up perfectly for a personal devotion or group discussion with post chapter questions, a memory verse, and a prayer. This is not the kind of book that can be rushed through, but one that should be studied and considered one subject at a time. I’ve gleaned so much from it, specifically regarding spiritual authority and endurance, though he touches on so many topics with excellence. 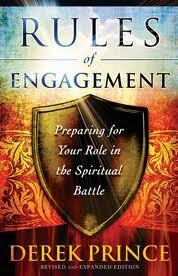 Also, whereas some spiritual warfare resources focus almost exclusively on parts of the battle (deliverance ministry, or casting out demons, or specific battles with health, finances, or so on), Rules of Engagement focuses on preparing for and understanding our role in the battle, which is why I think it is so valuable. I think every Christian could benefit from this compilation of Prince’s insight. I received a complimentary copy of this book from Chosen.